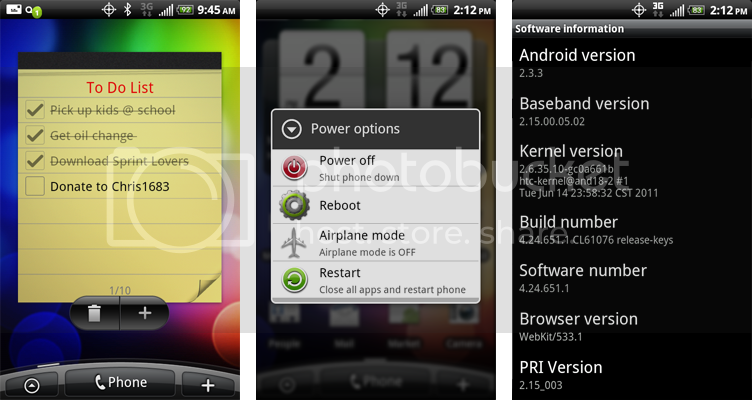 This ROM is based on the latest HTC build (4.24.651.1) and includes all of the Sprint goodies with a few extra twists. Those who knew me from Windows Mobile know my dedication for keeping a stock-like ROM with as much user choice as possible. Thanks to Calkulin, Conflipper, toastchf, aamikam & all who have contributed! -Using a file explorer such as Root Explorer, navigate to /data/animation and overwrite the files "bootanimation.zip" and "bootsound.mp3" with the files of your choice. Be sure to keep the file names exactly the same. 7. The PC36IMG will be scanned and the phone will ask to apply the update. Press VOLUME UP to select yes. When finished, press VOLUME UP to reboot the phone. 8. When the phone restarts and is at the home screen, connect it to the computer as a DISK DRIVE and delete the PC36IMG file from the SD Card. 3. While holding the VOLUME DOWN button, Power up the phone and it will go into bootloader and scan the PC36IMG.zip on the SD Card. Thanks for your ROM again! 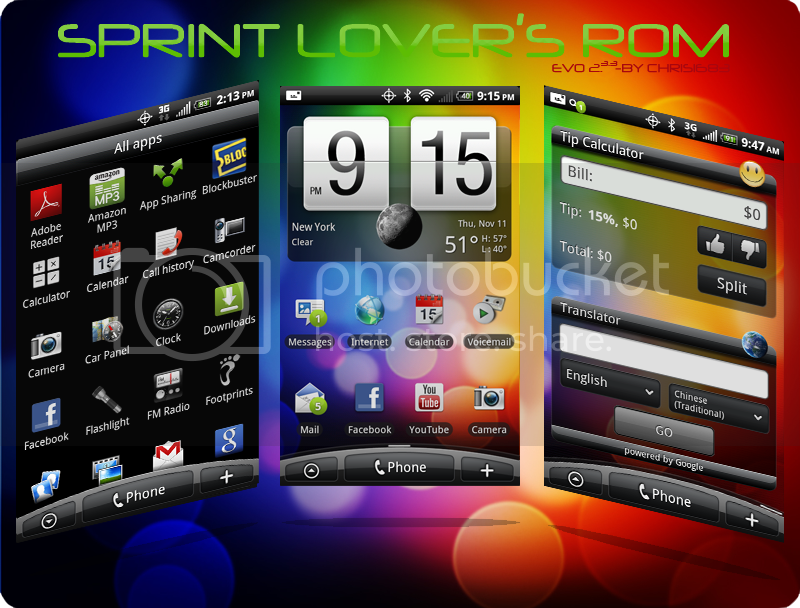 I really enjoyed your work back with the HTC Touch Pro 2!!! Glad to see you here. I rocked your rom on my TP2. Does your ROM update the radio and wimax to 2.05.00.06.10? On the latest ROM from others it appears 4g is broken with the latest OTA. The update does not include the radio or Wimax update so you will have to install those at your own discretion. Can I download through Rom manager? The the apps removable? I love to be able to choose what I don't want. Nice to see you cranking ROMs out for the EVO now chris!